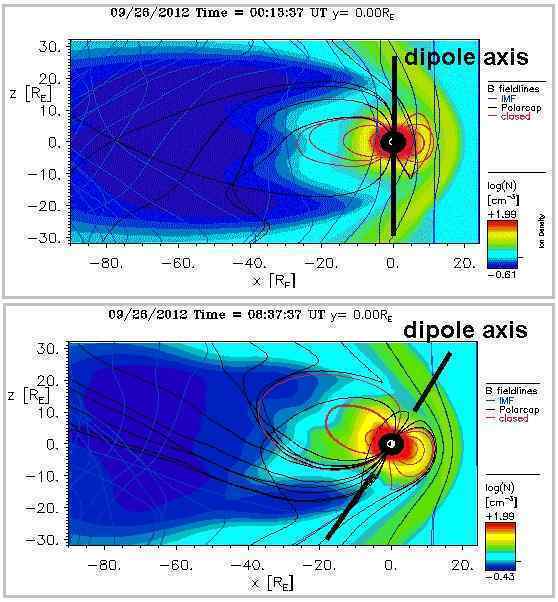 During the severe compression of Earth's magnetosphere on Sept 25 / Sept 26, Earth's magnetic dipole axis visibly begins tilting clockwise in the below BATSRUS animation at approximately 05:00 UTC Sept 26. There also appears to be a magnetic field external to Earth that is being asserted from the lower left during this tilt (see bottom image). Does this tilt of Earth's magnetic dipole portray a temporary lean to the left? Are the magnetic field lines in the lower left of the bottom image a depiction of Planet X's magnetic influence or perhaps the Dark Twin's presence behind Earth? We have depicted the twisting magnetosphere of Earth as due to the presence of Planet X. Magnets want to go side-by-side (as the planets do with the Sun) or end-to-end. They can temporarily form a single field, the smaller magnetic field being absorbed into the larger field, or the smaller one can appear to twist if not directly end-to-end. If not allowed to go end-to-end and too close for a side-by-side arrangement, the lesser magnet can go into opposition or attempt to form a T arrangement, which for the Earth is a lean to the left. For the effects the Council of Worlds wanted, to force the announcement admitting the presence of Planet X, there were temporary changes to the magnetic blast coming from the magnetic N Pole of Planet X toward the Earth. On September 15, 2012 and the week following, light rays were bent to enhance the viewing of the corpus of Planet X. On September 21, 2012 and the week following, the charged tail was disbursed and the Moon Swirls illuminated. That the dipole of Earth’s magnetic field tilted toward the Sun and the approaching Planet X was directly due to the need to disburse the charged tail of Planet X. This was done by increasing the magnetic particle flow hosed toward Earth so the charged tail blew outward to the sides. What can those watching the Earth’s magnetosphere expect as Planet X continues to point its N Pole directly at Earth? We have predicted a great deal of switching about, as this occurs. Magnetic fields are not rigid, they are plastic, and also ebb and surge in waves. The 7 of 10 plate movements have much to do with the switching about the Earth does, from one posture to another. We have termed this a wobble within a wobble. If the Earth leans its N Pole away from Planet X during the daily wobble, when the Earth’s magnetic N Pole comes up over the horizon, but then the Earth decides to go into opposition to meet a particularly harsh blast from Planet X, that is as Elvis used to say “shake, rattle and roll” – a back and forth and side to side effect almost simultaneously. A look at the dipole of Earth’s magnetic field at the end of the spring and start of the summer trimesters. BATSRUS Y-Cut images April 14-15, 2019. Images taken at the top of each consecutive hour for 24 hrs. With the added black Bx line in each image in the second part. Some recent BATSRUS Y-Cut images over the past few months. The first half of gif's as seen in cygnet.In the second half I've added the black Bx lines to the same images to give an ideal of the switching about currently Earth is doing. We have been having micro tremors lasting 1-2 sec since 2007 here in Denmark, and you are right Stephan most people will claim that they hear nothing as the experience is suppressed into the subconscious due to the unexpected and dramatic/biazare nature(compared to regular day to day life), this sound is heard all over the world in dif places and all of us along the E-W of the Atlantic are hearing it, be glad that you are present in reality. Stephan, I have noticed this too. Last week my desk was shaking for about 2-3 minutes, I pressed my hands down to make it stop and as soon as I stopped it started shaking again, desk and monitor in all. My office is by an above ground subway and it is normal to have some vibration when they pass as well as a lot of noise, yet the trains have never shook my desk. When my desk was shaking last week it was very quiet with no subway trains in the area or construction vehicles to cause it. It actually alerted me enough to get up from my desk and look for the source. I ended up not finding anything. No earthquakes were reported in Chicago so I can only assume what the source was... the earth changes. thanks Nancy. so, the timing, content and tone of the announcement should tell us if the elite(STS) or the elected (STO) are in control. Is the message going to intensify public panic or be used to inform the public in a manner that would encourage rational behavior? I'm sure that is not Obama's intent, but those who wanted the cover-up continued were more concerned about THEMSELVES than informing the public. It is not the city (Washington) but the spiritual orientation and agenda of individual, thus the preferred term is "elite" or "STS". I am not sure if this correlates with the Earth leaning over the past couple of weeks? I have been feeling quite lethargic from 12-2pm over the past couple of weeks, and when it hits it is like a brick, very sudden and undeniable, (East Coast of Australia). I am aware of Emanation illness as per Mariaelisa Torres see December 2010 post.